Questions about a yellow water heater flame? If you are in possession of a standard atmospheric water heater, you should always have a nice blue flame underneath the tank. (This flame is what heats the water.) Just like the burners on your gas stove, you want that flame to be blue – this indicates that the flame is the right temperature. If the flame is burning yellow, that means it is burning too cool. So, what to do? Most of the time, the yellow flame simply means that your burner needs to be replaced. Get a new burner and that should take care of it – a fairly simple solution! 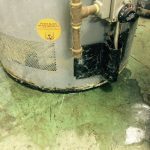 However, if you see burn marks together with that yellow water heater flame, it could mean that your unit is starving for the air it needs to burn. This is a serious problem and will cause early water heater failure! So make sure to call a trained technician if this is the case. Reliable Water Services are available to businesses in Wisconsin and Indiana for all your water heater needs – including technical assistance and water heater replacement. Give us a call today to see how we can diagnose your water heater problems and help provide you with solutions!